Foley Landscape Contractors in Cornwall, N.Y. is a full-service landscape and grounds maintenance company serving commercial and residential clients in Orange, Dutchess, Rockland and Westchester counties. Our wide variety of services includes everything from lawn care, to fertilization, to drainage work, to trimming and pruning, to patios and walkways and snow removal. Our experienced, knowledgeable and professional staff has more than 50 years of combined experience. We have created and maintain beautiful lawns, gardens, patios, walkways, and creative outdoor living spaces for hundreds of satisfied clients. Owner Brian Foley, a FDNY firefighter, prides himself on unmatched customer service and reliability on every project. 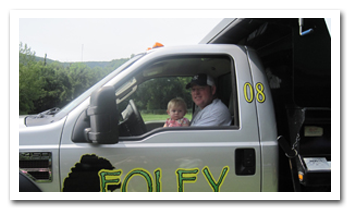 Under his watch, Foley Landscape maintains a fleet of trucks, excavators, loaders, and all the necessary small equipment to install our landscapes. We have multiple crews and are available 24 hours a day. At Foley Landscape, we pay attention to every last detail, and stand behind all of our work. We take pride in everything we do and guarantee your residential or commercial property will never look better.